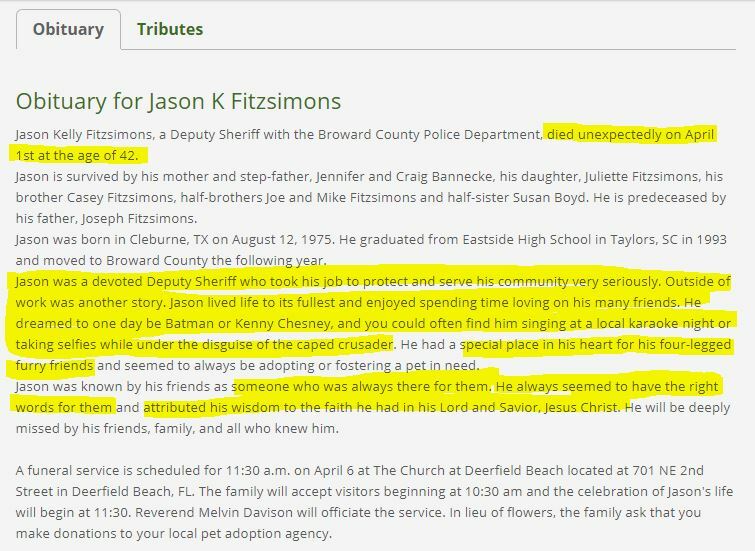 Sometime on or around April 1, 2018 Broward County Sheriff’s Deputy Jason Fitzsimon, 42 years old and in excellent state of mind and health, called in sick to his job. Shortly thereafter Fitzsimons was found dead on his sofa. There has been a complete “news blackout” of this curious and untimely death. 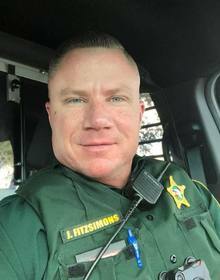 Deputy Fitzsimons wasn’t just any law enforcement officer. Unlike many of his peers, he took to social media to question the potential agenda behind the February 14 Marjory Stoneman High School mass shooting, suggesting that the event was being used to promote the Democratic Party’s gun control platform in anticipation of the 2018 midterm elections. And recent personnel decisions involving public officials indicate (e.g. here and here), an unwritten law of taxpayer-funded institutions is that employees disavow and steer clear of “conspiracy theories” that may call their superiors motives into question. 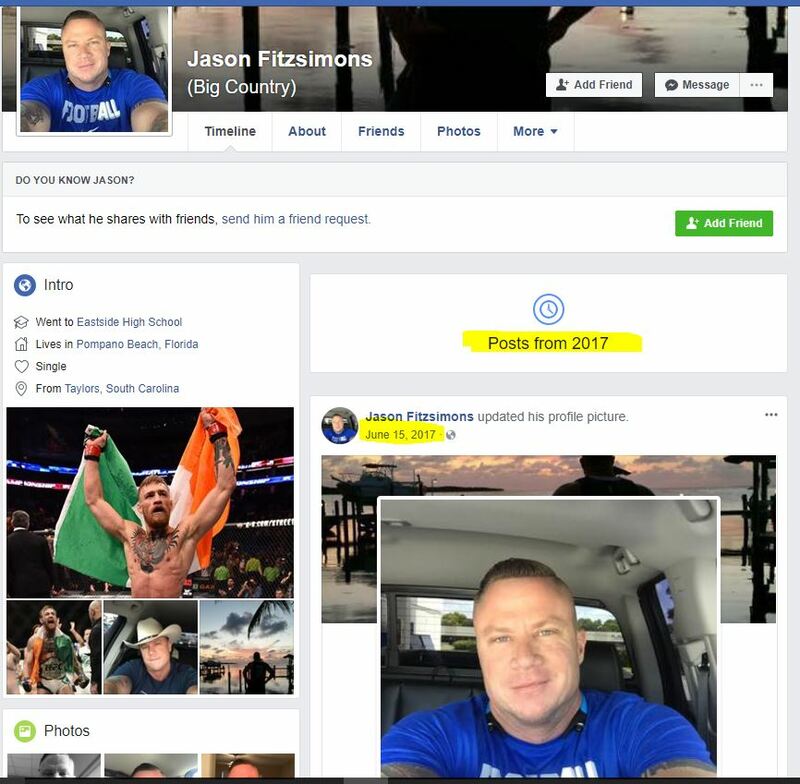 Fitzsimons Facebook page has since been “scrubbed” of any 2018 posts, which would of course include those that may be calling the the Parkland shooting or its aftermath into question. The circumstances surrounding Deputy Fitzsimon’s death are sketchy. 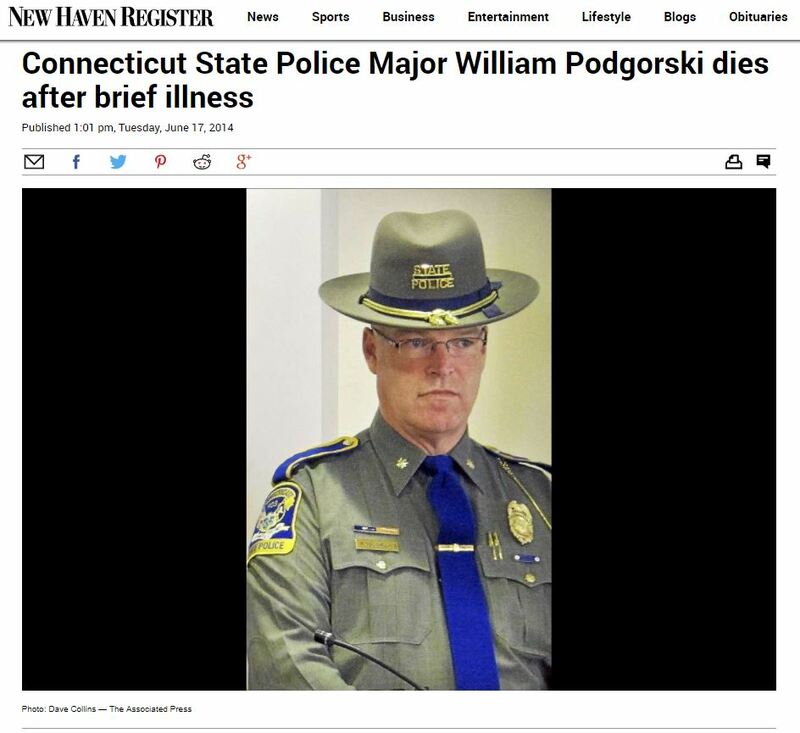 The official cause has been attributed to cancer, yet this is contradicted by an obituary found at obittree.com, stating that he “died unexpectedly.” The “died unexpectedly” phrase is one morticians and/or loved ones sometimes employ when for one reason or another they are reluctant to disclose the true cause of death, as in the case of a suicide. Those who received word via Twitter of Fitzsimon’s untimely death have expressed similar doubt and suspicion on the vague and unusual circumstances. 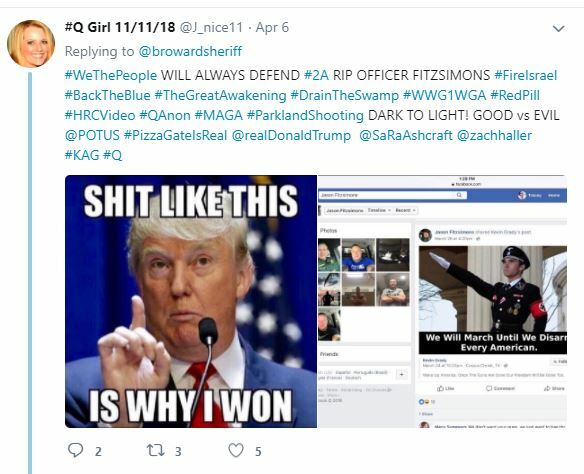 As is suggested in the aftermath of other recent mass shooting events, Fitzsimons simply may have possessed too much information, was at the wrong place at the wrong time, and/or asking sensitive questions of his peers and superiors on the specifics of the Parkland shooting. It is beyond dispute that the sheriff’s deputy had become uncomfortably outspoken on the February 14 event. We are rapidly approaching a total absence of law in this country. We look at all the various hearings going in in Congress and find, glaringly so, that nobody is getting sent to the slammer. Why is it this way? We hear outrageous statements like “once the Dems get back in, we’ll increase taxes drastically”. Are these the words of out and out traitors? I think so. The attorney general is clearly compromised as are many other prominent figures. A lawless state has spread over the nation. And, still, the majority of Americans are most concerned if they’ve got the latest and greatest electronic gadgets not the fate of the nation. Have we become this dumbed down? To answer your last question Bahmi, you have to go investigate how the education or “academics” of the US and the world was deliberate dumbed down. Charlotte Iserbyt- The Deliberate Dumbing Down of America. Somehow US citizens, on whose behalf these various whistleblowers attempt to reveal secrets, crimes and to demand justice, MUST start returning the favor and advocating for them. WHEN THEY SPEAK OUT and BEFORE they are killed for it—to STOP them being killed for it. Recall Matt Simmons during BP oil spill, or Gary Webb, Bill Cooper…?? Should be a network or central site they can go to and document their circumstances and be tracked by those protecting their asses. Certainly the govt is- for bad motives. WE must watch them- but to make sure they are not alone in speaking out. Brainstorming here… America help them- Help yourself too by keeping the good guys alive! Thank you Jim for a compassionate and excellent article about Officer Fitzsimons. Regarding the question about cancer, while cancer can develop at any age, usually it takes decades to reach the stage with obvious symptoms. If he had cancer he was likely under cancer treatment. All approved cancer treatments are life threatening. Therefore when a person with cancer who is also under cancer treatment dies, they could have died from the cancer or the treatment or both. The only way to prove the cause of death is from an autopsy performed by a top independent pathology laboratory. Most media articles blindly state a person died of cancer without any further ado. This kind of statement is totally false and misleading. Most patients die of treatment but falsely reported as from cancer to protect the doctors and pharmaceutical companies from claims. While he could have had many different types of cancer, the most likely ones would be prostate cancer or pancreatic cancer or liver cancer. If he smoked he would possibly have lung or throat cancer. In advanced stages a cancer patient loses weight due to the switch from oxygen based metabolism to anerobic glucose based metabolism or a disease called cachexia or wasting disease. Such weight reductions in advanced cancer patients are obvious and dramatic and easily noticeable by friends and relatives. Also pancreatic and liver cancer can result in jaundice or yellowing of the skin. If cancer metastasizes to other organs, this can accelerate the arrival of death. Normally a person in good health at age 42, a relatively young age, would not develop these horrible sorts of cancer unless he happened to be exposed to some unusual radiation or chemical exposure. I didn’t read any mention of his wife or Mother of his daughter. My late Father died while swimming in a quasi public swimming pool at the YMCA in Pasadena, California with no lifeguard present. This was in the county of Los Angeles. In all such cases, they have very strict rules that the body is automatically sent to the County Pathology Laboratory for autopsy without any consultation with the family. Drowning can present difficult confounding evidence because it masks other effects. My brother actually went down and talked to the medical examiner who did the autopsy which was a report of over 200 pages. He was very helpful and eager to talk and explain everything. Frankly, in the case of law officers who die under these circumstances. I think a similar law to automatically perform such an autopsy on the body would be a very intelligent thing to do. However, it must be done by a totally independent laboratory where conflicts of interest must not enter. This can be a very difficult problem if evil people are around who seek to cover up crimes and possibly abuse their positions of authority. Frankly every cancer patient who is under orthodox treatment, should be required, as a condition for such treatment, to have a complete autopsy at death, without any consultation with family. This is the only true way to determine if the patient died of cancer or treatment or both. But it must be performed only at a top independent pathology laboratory where no conflicts of interest could possibly taint the results. This is not an easy obstacle to overcome when powerful selfish interests like doctors and pharmaceutical companies are involved. I get the feeling that the Deputy was very, very concerned about his health. 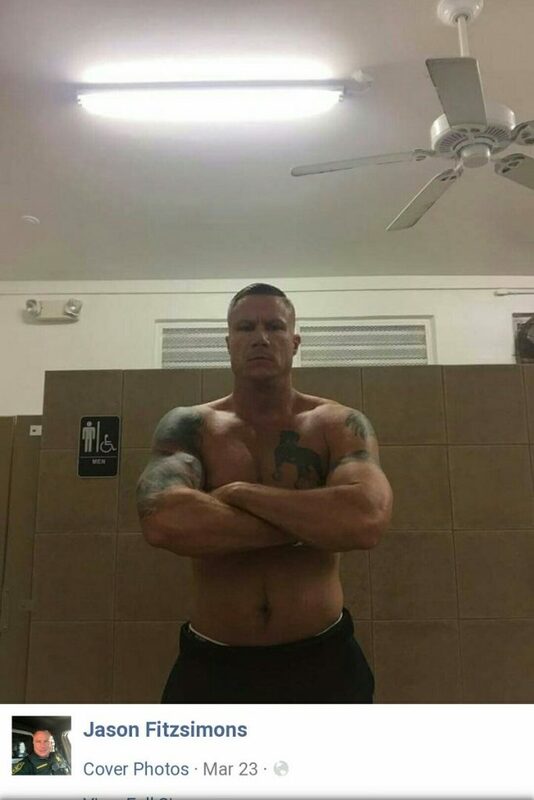 Besides needing to meet municipal standards for well being physically, judging from his physique, he was obviously in tune with his body in every way. Cancer does not go from the unicellular stage to massive Stage IV levels overnite or a similar short period. However, if an individual is Arkancided, yes, things can often come about very rapidly, like the muzzle velocity of a bullet or the famous CIA heart weapon that can thrown one’s heart into rapid arrhythmia and lead to death in short order. That sounds true on the surface but over the years I have heard Dr. Stanley Monteith speak about cases of fulminant cancer by major players in high-profile crime cases. Jack Ruby, I think, experienced a rapid onset of cancer and rapid death. Many different kinds of diseases, including, cancer, can become fulminant for natural occurring reasons, but it is my understanding that it is extremely rare in cancer. It becomes exponentially more rare when someone is about to turn states evidence and testify in court or finds irrefutable proofs that blow the official narrative to bits or simply knows too much and asks too many inconvenient questions. Maybe there should be strong gun control laws for the cancer gun and the heart attack gun. I always felt Jack Rubinstein aka Ruby was put to sleep. With the massive amount of lies in the Warren Commission report, what can a reasonable person surmise? In short order, Lee Harvey Oswald knew he was played like a fiddle, a fool. He simply knew too much, he was eliminated by a FBI man. Dr Fetzer, I believe, has shown some photos he got from Ralph Cinque that substantiated shots were fired by the FBI man and not Ruby. Over 50 years later, lies are still being circulated and the exposure of old records come with many redactions. All of us are trying to make sure the truth gets out about Sandy Hook and the multiplicity of false flags and I hope we can expose the parties involved. I think Trump is well hated by the Deep State as well as the Tribe, we’ve got our work cut out for us. But, take heart. It’s either truth or bust and we’ve got to try and save this rotting nation. Uphill battle?, yes, for sure. It depends on the state law. If you have a family physician at time of death, Wisconsin law states that an autopsy is not automatically required to be done. Pingback: Broward County Sheriff’s Deputy Dead at 42 – I.A.M. The Aurora shooting was weird too, reports of LEO chasing a suspect wearing a backpack across mall parking, meanwhile the guy they eventually pinned it on was wandering around the scene in a daze, a thousand yard stare and a goofy smile on his face, for a long time before someone eventually got suspicious because he went and sat down in his car. He then proceeded to tell investigators that his apartment was rigged to explode should anyone try to enter it. It’s like he was stoned out of his gourd, not a state of mind conducive to a mass murder attack. Survivors of the Aurora shooting have gone on record saying the same thing that every mass shooting survivor has said starting with Columbine: That there were multiple shooters, because gunfire was coming from more than one place. In the Aurora case, witnesses described gas canisters entering the theater through the exit doors, coming through the doors simultaneously. The doors are very far apart, on opposite corners of the room. One person could not have lobbed gas through both doors at once. Later, the Aurora shooter walked through a doorway into courtroom for his trial, which the Judge declared secret. Those courtroom doors closed and the Aurora shooter vanished without a trace. The recent bombings in Austin have weirdness associated with them as well. News reports all say the bomber died after an explosion in his car, presumably one of his own bombs going off. But I live in the area, and there are credible reports that the guy was still alive but very badly injured when SWAT reached his vehicle, and they basically executed him on the spot. San Bernadino shooting had LEO pursuing multiple suspects as well, in multiple vehicles. Most mass murderers seem to want to “suicide by cop” so they don’t have to face the music. What’s interesting is what happens to them when they aren’t killed in the process of comitting their crimes. They vanish, or die, somehow. Much like the famous assassins of US presidents, Oswald and Booth, both survived their seemingly suicidal missions, only to be killed shortly afterwards, conveniently keeping them from going on trial. I know people generally recoil from anything that smacks of “conspiracy theory”, but they really shouldn’t. History is basically a record of nonstop, ongoing, overlapping conspiracies, usually at the highest levels of society and government. Conspiracies are the norm. So why is there such a social stigma against them? Whatever the answer is, you gotta admit it’s sure helpful to any conspirators out there. If someone is about to reveal your dark conspiracy all you have to do is mention something about tin foil hats and say “wacky conspiracy theorists”, and no one will take them seriously. Very useful. If I call something a conspiracy theory, what does that mean? Does it mean I don’t believe it and have proof or does it mean I know squat and anybody differing from me is clearly cuckoo? It’s a blanket perjorative disagreement and it can come about when the perjorativee’ is showing his moral outrage or condenscension toward the evocator of the “theory”. I’ve had many people in the no that use that hubristic term because they know they don’t know much if anything about the subject matter. It’s a mark of scorn, it’s a denigration, it’s haughty. Allegedly, only 23% of Americans feel Sandy Hook is fishy. I find that absolutely mind blowing. Do 77% of Americans believe Larry Silverstein? I also find that mind blowing were it to be true. Never overestimate the smarts of the average American dullard. Hello, that FB post is mine and I would like credit for it. I got the screen shot before they scrubbed his media. good job thanks, I screen cap, a lot now days and back up stuff, because I have noticed things completely vanish a lot. Another thing that happens is thing get edited to complete change what they had originally said. Under separate cover, I’m sending you a refund on your umbrage! Thanks for the notification. I’m sure if the coroner was “interrogated” he would spill the cause of death. I HATE when scripted events like these are purported to be ‘real’. Unfortunately, the terms used in the pictured Google search was just plain bad. While it is true that the untimely death is convenient for somebody, that bad Google search doesn’t necessarily mean there was a “news blackout. It just means that was a bad search. Even more restrictive, at present those search parameters yield the same result. He has two Facebook profiles. The profile with him in his cop uniform has the 2018 activity which has not been “scrubbed”. It’s public, check it out. Stop creating hype over nothing. 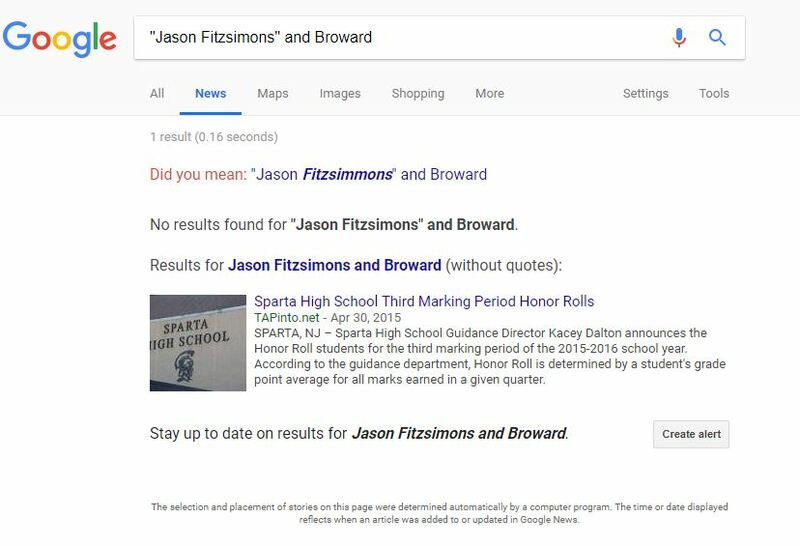 Google’s failure to show posts regarding Jason Fitzsimons’ death reflects very poorly on Google. The same search on DuckDuckGo.com produces a long, interesting list of articles. 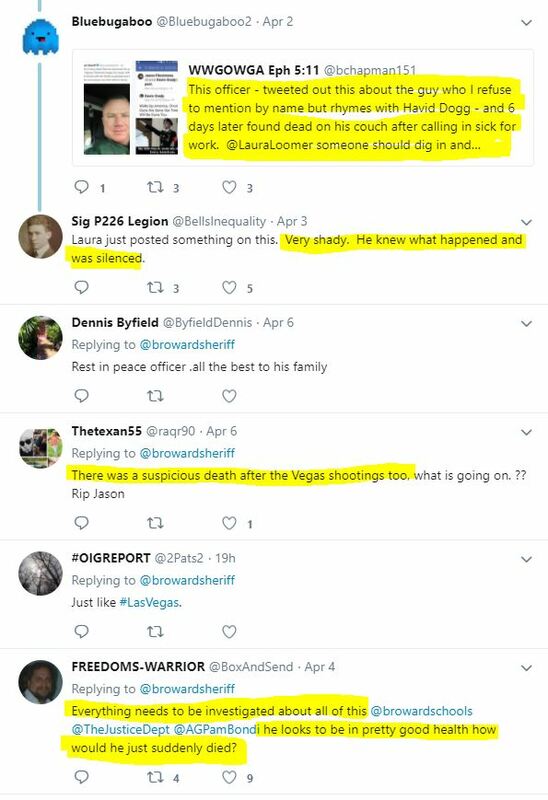 If the death weren’t suspicious, Google wouldn’t be censoring it. Who is behind Google’s censorship? Will Scott Israels firing shed any light on the death of Jason Fitzsimons….. 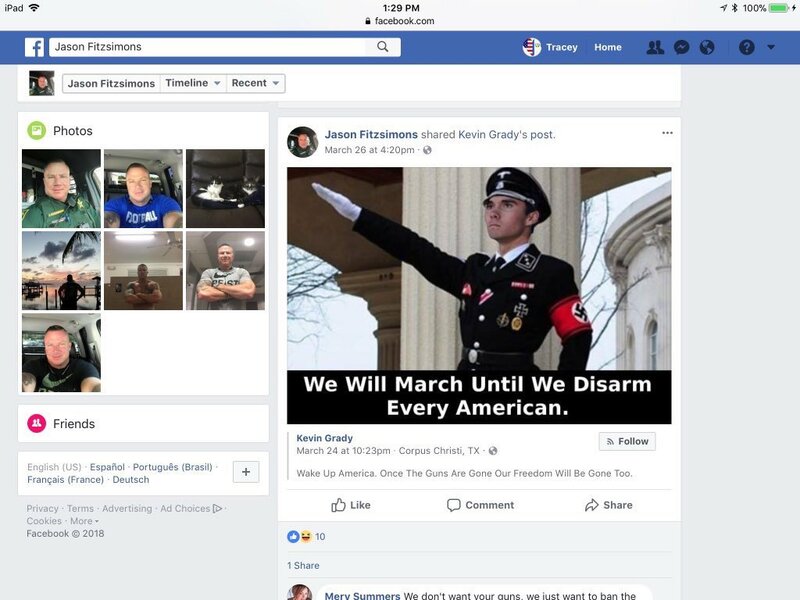 So I’m not downplaying this guy’s mysterious death at all, but I do have to point out that the picture of Hogg on Fitzsimmons’s FB page does not show him in National Socialist regalia. It shows him in Nazi regalia. The nazis were not Socialists. They were Fascists which is the complete opposite end of the spectrum from Socialism. That is an important historical distinction that is all too often bungled. Hitler was evil but not a Socialist. And either out of ignorance or out of a desire to deceive the ignorant, it seems that Hitler and the Nazi party is being incorrectly labeled as Socialist to further vilify and deligitmize Socialism.